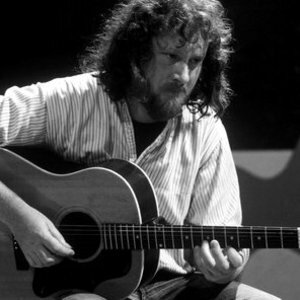 John Renbourn (born August 8, 1944, Marylebone, London, England) is a British guitarist and songwriter. He is possibly best-known for his collaboration with guitarist Bert Jansch as well as his work with the folk group The Pentangle, although he maintained a solo career both before, during and after that band's existence (1967-1973). While most commonly labelled a folk musician, Renbourn's musical tastes and interests take in early music, classical music, blues and world music. His most influential album, Sir John Alot (1968), featured his take on songs from the Medieval era. While most commonly labelled a folk musician, Renbourn's musical tastes and interests take in early music, classical music, blues and world music. His most influential album, Sir John Alot (1968), featured his take on songs from the Medieval era. John Renbourn studied classical guitar at school and it was during this period that he was introduced to Early Music. In the 1950s, along with many others, he was greatly influenced by the musical craze of "Skiffle" and this eventually led him to explore the work of artists such as Leadbelly, Josh White and Big Bill Broonzy. In the 1960s the new craze in popular music was Rhythm and Blues, also the impact of Davey Graham was being felt. In 1961 Renbourn toured the South West with Mac MacLeod and repeated the tour in 1963. Renbourn briefly played in an R'n'B band while studying at the Kingston College of Art in London. Although the British 'Folk Revival' was underway at this time, most folk clubs were biased towards traditional, unaccompanied folk songs and guitar players were not always welcome. However the Roundhouse in London had a more tolerant attitude and here, John Renbourn joined Blues and Gospel singer Dorris Henderson, playing backing guitar and recording two albums with her. Possibly the best known London venue for contemporary folk music in the early 1960s was "Les Cousins" in Greek Street, Soho, which became the main meeting place for guitar players and contemporary singer-songwriters from Britain and America. Around 1963, Renbourn teamed up with guitarist Bert Jansch who was visiting London from Edinburgh and together they developed an intricate duet style that became known as "folk baroque". Their album "Bert and John" is a fine example of their playing. Renbourn released several albums on the Transatlantic label during the 1960s. Two of them, "Sir John Alot" and "Lady And The Unicorn" sum up Renbourn's playing style and material from this period. "Sir John Alot" has a mixture of jazz/blues/folk playing alongside a more classical/early music style. "Lady And The Unicorn" is heavily influenced by Renbourn's interest in early music. At around this time, Renbourn also started playing with Jacqui McShee who sang traditional British folk songs. Together with Bert Jansch, bassist Danny Thompson and drummer Terry Cox, they went on to form Pentangle. The group became very successful, touring America in 1968, playing at the Carnegie Hall and at the Newport Folk Festival. Renbourn went on to record more solo albums in the Seventies and Eighties. Much of the music is based on traditional material with a Celtic influence, interwoven with other styles. He also collaborated with American guitarist Stefan Grossman in the late 1970s recording two albums with him, which at times hark back to the folk baroque days with Bert Jansch. In the mid-1980s Renbourn went back to university to earn a degree in composition, since which time he has focused mainly on writing classical music, while still performing in folk settings. Renbourn continues to record and tour. In 2005 he toured Japan (his fifth tour of that country) with Tokio Uchida and Woody Mann. In 2006 he played at number of venues in England, including appearances with Robin Williamson and with Jacqui McShee. He is working on a new solo album and collaborating with Clive Carroll on the score for the film Driving Lessons directed by Jeremy Brock. In 2008, he toured with the reformed Pentangle.